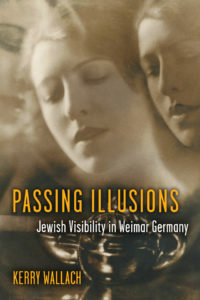 Passing Illusions Jewish Visibility in Weimar Germany (University of Michigan, 2017). In her new study, Passing Illusions: Jewish Visibility in Weimar Germany, Kerry Wallach (Gettysburg College) challenges the notion that Jews in Weimar-era Germany sought to be invisible or indistinguishable from other Germans by “passing” as non-Jews. While Weimar Germany (1919–33) was an era of equal rights for women and minorities, it was also marked by antisemitism and growing hostility toward the Jewish population. This led some Jews to want to pass or be perceived as non-Jews; yet there were still occasions when it was beneficial to be openly Jewish. When Wallach discusses her book with moderator Noah Isenberg (the New School), they will cite examples not only from the historical sources that Wallach draws on for her scholarly study, but the new German television series Babylon Berlin as well. The most expensive German television production in history and a vivid portrait of the political and cultural ferment of Weimar Berlin, Babylon Berlin features at least one explicitly Jewish major character. However, as Wallach and Isenberg will explain, this series about a detective on the trail of illegal arms smugglers in the Reichswehr is rich in examples of how manners of dress, dialects, political affiliations, professions, and consumer habits might have been legible as Jewish, non-Jewish, or ambiguous. It also offers opportunities to explore the ways in which markers of Jewish identity intersected with class, gender, and other social identities.